John and Dawn Plimmer arrived in good weather after a three hour drive, marred by four time consuming roadblocks for road repairs along the way. We found the cottage in good order and started the tedious job of carting all the heavy gear up the 35m/100ft high sand dune. That's got too much for us old septuagenarians and we vowed this would be our last trip to Jongensgat, as ideal as it is. We had heard of another beach cottage an hour further up the road towards Mossel Bay, so Thursday we went up and had a look, but the cottage was primitive and disgusting and the lie of the land for the antennas was not good, so that was out. I will rather go to Seefontein twice a year instead, as it is ideal and the DX to N. America is superb. Vince Stevens, my co DXer arrived about an hour after us and soon got started on stringing out his two beverages and my one. Sunset was at 6.20 local time and by five thirty we were all ready to go. I had my Kiwa MW Loop rigged up after its years layoff for breakdown, but now all was well and it was soon evident that it was working champion and was better than the beverage Vince had laid out for me. Perth 720 came in an hour before sunset, boding well for the evenings DX. Just after sunset, 891 5AN ABC Adelaide was booming in like a local at 1639z, very satisfying. Monday night and Tuesday morning I did not do very well, the Kiwa Loop was far outperforming the beverage, so I discussed this with Vince on Tuesday and he said he would add more length to the 200m he had laid out, on Tuesday night it was longer at about 350m. Tuesday was a nice day and we decided to have our traditional braai (barbeque) - Vince made mountains of boerewors (spicy farmers sausage), lamb chops and steak and Dawn had some chicken kebabs. Vince washed his down with a single malt Scotch and Dawn and I had a fine local sauvignon blanc. Meanwhile I had brought along my Perseus SDR and could not make head or tail of the recordings, they were all noise and no signal. I checked everything exhaustively but could not improve on the poor performance, so after another full go at it on Tuesday night and Wednesday morning I gave up and disconnected it in disgust. Later back at home QTH I got it working again satisfactorily by upgrading to version 3beta1 and restoring factory defaults settings. I never discovered what made it dysfunctional on the DXpedition. A great pity as the LF NDB DXing was exceptionally good on Wednesday and it would have been lovely to have the full Perseus recordings. Tuesday night I did better on the extended beverage but the Kiwa was still better, indicting this antenna was not all that great. Wednesday morning I was only getting Brazilians, which I am not much interested in, so I had a full session on LF NDB DXing and got some nice Brazilians from across the Atlantic. These beacons are very low powered, so getting them 6,200 km's/3,800 miles away is a great thrill. Wednesday evening was good "meat and potatoes" catches, but nothing really that I haven't heard before. Thursday morning likewise. Vince and I discussed my beverage that was not performing too well in its New York/Perth alignment and he decided to realign it more N/S parallel to his very well performing "magic" N/S beverage. Wednesday a winter Antarctic storm swept over us, and the waves were huge, crashing on the rocks below us and sending up giant sprays of foam. The waves were by far the biggest I have ever seen in the seven years we have been coming to Jongensgat. 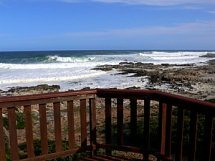 We did a session of shopping in nearby little town of Stilbaai, I caught up in an internet cafe, and we took back lovely fresh fish and chips to the cottage for lunch. Thursday we went looking for the new proposed cottage, which as described earlier was a huge disappointment. Vince's "magic" N/S beverage was really producing the results, but mine was still not great, so Vince tweaked it a bit by straightening it out some and keeping it a bit more evenly 3ft/1m above the deck. This gave me great results on Thursday evening as in quick order I got ABC 5PA Naracoorte the far side of Adelaide, and a gospel station in the Philippines, two great catches. Friday morning I got "Big L" in Holland and R. Ulster, both nice catches. As the sun came up, 1700 kHz started strengthening and well after sunrise I ID' "1700 KVNS" Brownsville TX and "San Diego 1700" - The XEPE Tecate station is 16000km/10000m away and is always a great catch, although it is often heard here and at Seefontein. Vince and I were both getting mystery stations relaying BBC WS - only on return home and enquiring on the web it was revealed that ABC Australian stations are now relaying BBC in the wee hours of the night. length 225m/750ft - Wire was 0.8mm/.03inch enamel copper, running dead straight - elevated about 1m/3.5ft above the ground on average I'd say..
Wire was terminated into a homemade 9:1 balun (Converting Z (impedance) from 450 to 50 ohm) and then run into the cottage via RG58U coax. No earth terminations, so antenna was bi-directional. 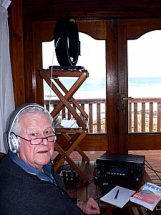 Altogether, not my best DXpedition at Jongensgat, but its always a great pleasure to be there, both for the idealic seaside scenery and the excellent radio reception. A bad day at Jongensgat is always a hundred times better than the very best day at home QTH in Montagu. John Plimmers logs - Icom IC-7600 RX and various beverages, best of which was N/S 200m, and the Kiwa MW Loop performed superbly. 900 16h45 13.Sept AUSTRALIA UNIDENTIFIED not // to R.West, ABC or RN synchros. Talk about arrests in NSW and discussion on alcohol abuse and anti-social behaviour. fair briefly then 6BY dominated the channel again.